Sunny weather is here, and this outfit will help you and your little miss celebrate it! Let your little girl romp about in this suntop with crisscrossed straps. She’s sure to have an extra skip in her step with this fantastically frilly skirt. Make the skirt in 1 or 3 different fabrics. Yardage shown. 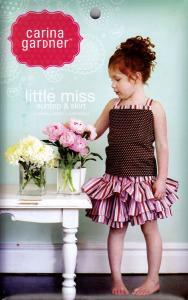 The top and skirt combo comes in 5 sizes (XS-XL) and can be fitted to sizes 2T-8. Suntop fully lined for a professional finish.